Accommodation of the Year 2015 - Quality Award in the Category of 4-5-star Hotels I. 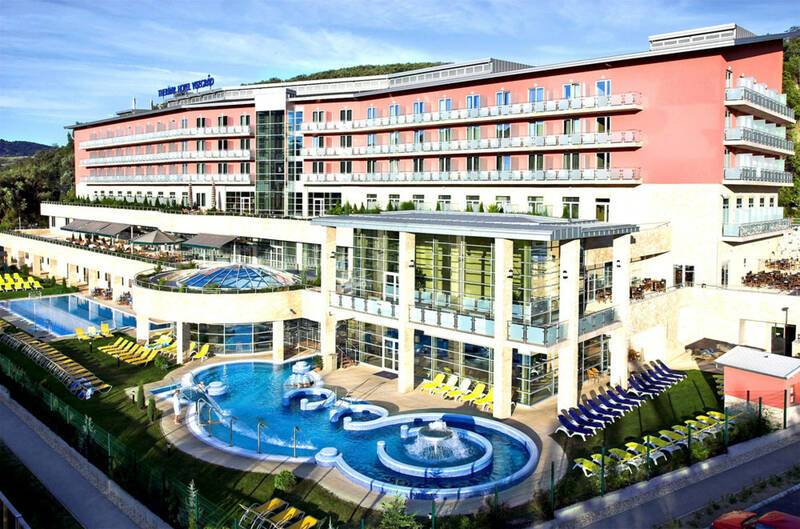 45 kilometers from the capital city of Budapest, in Visegrád, near the Danube, right next door to the famous Thermal Bath and Pool of Lepence. Located within the top vacation district of the Danube Bend, Visegrád lies at the foot of the picturesque Börzsöny and Visegrád Mountains. Nearby attractions including the Citadel, the King Matthias Museum, and the Salomon Tower. Number of rooms: 174, of which 4 junior suites, 6 suites, 164 double rooms. The rooms have a magnificent panoramic view to the Danube band, to the Pilis Mountains or to the Castle of Visegrád. Duna Restaurant and Lepence Restaurant, with capacities up to 280 people, offer international and Hungarian specialties as well as dietetic menus. From the restaurant and the seasonally terrace is a wonderful view to the Danube band. Café Türkiz, Topáz Drink Bar, Aquamarine Pool Bar provide full service. The Hotel offers wide range of ideal settings for company events, conferences, meetings, banquets, receptions, cocktail parties, weddings and garden parties. To organize a memorable event, you can choose among our air-conditioned conference rooms complete with the latest technical equipment and our restaurants with open-air terraces. On request, our staff will be happy to arrange a variety of services for you: hostess, interpreter, photographer, live music, and organized programs. Visegrád’s natural treasures include a mineral spring, with 39 °C water of mineral water quality erupting from 1300 meters below. Widely known for its astringent and anti-inflammatory qualities, this thermal water is rich in calcium; magnesium and hydrogen carbonate, and also contains several trace elements crucial for the human body, as well as alkaloids low in salt. The thermal bath at the hotel is filled with this valuable medicinal water, which reaches the surface just a few meters away from the hotel. 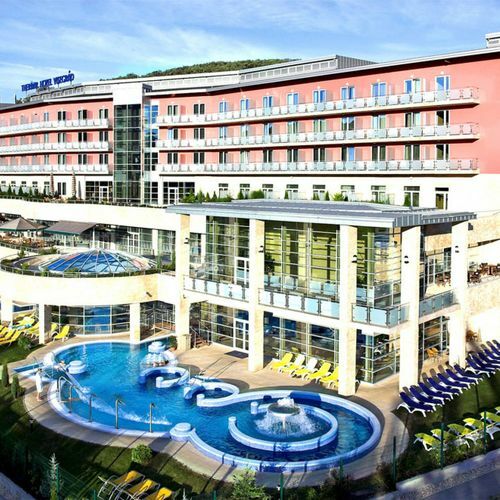 The rating of Thermal Hotel Visegrád is 9.2 from the maximum 10, 1197 based on actual and valid guest ratings and reviews. "Kedves a személyzet! Színvonalas az Étterem! Maga a Wellness rész minden igényt kielégítő!!" 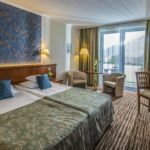 "Kellemes, nyugodt pihenésre alkalmas Hotel. Csak ajánlani tudom. Nagyon tetszett az online bejelentkezési lehetőség." "A matrac kicsit már kifeküdt volt,középen bemélyedt.A vacsoránál ,amely tényleg minden igényt kielégît,elvártam volna egy kancsó vizet az asztalon,mert az ital árak csillagászati magasságokban voltak!" "Tisztaság,kellemes környezet!Az étterem ételei kifogástanak voltak,hatalmas választékkal!!" Based on the reviews and comments of actual guests, the services of the Thermal Hotel Visegrád have received a high rating of 9.3/10.